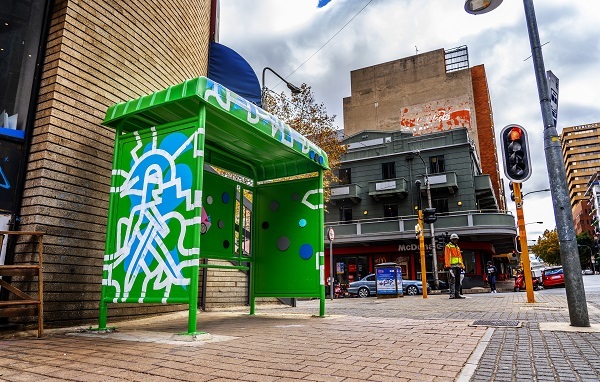 If you’ve caught the bus recently, or been around areas such as Rosebank, Melville, Braamfontein, or Greenside, a few special bus shelters might’ve caught your eye. 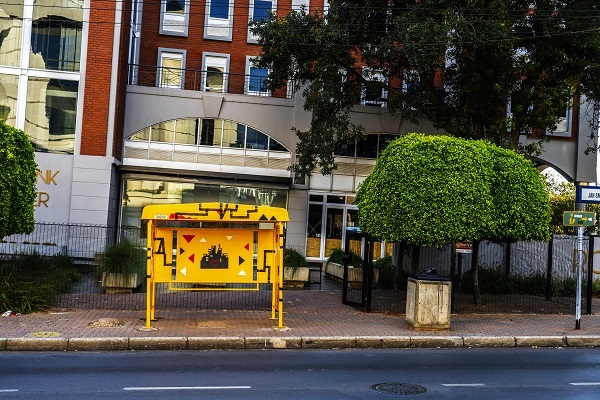 The bus shelters, done by Cape Town-based creative duo Mr and Mrs Luke, feature plastic building blocks, vinyl cut-outs, and thick swatches of paint and were actioned out as part of a recent campaign for Halls SA. 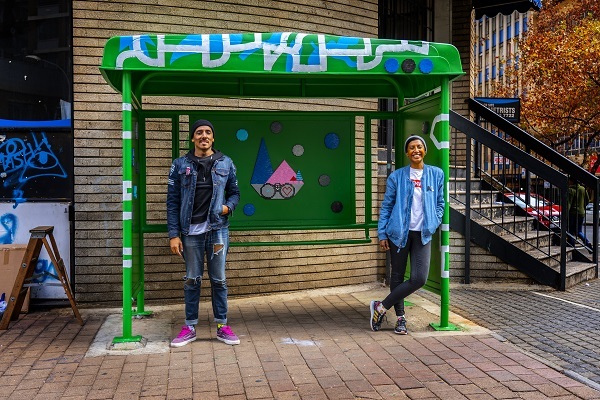 We’re huge fans of any kind of public art in the city, and so after seeing these bright works pop up all over town, we got in touch with Faatimah and Al Luke to find out a bit more about the work they do, and how they went about beautifying these bus shelters. Read the QnA below and check out images of all the bus shelters. How did the two of you conceptualise the works for each bus stop? We were given a moment as the inspiration behind each bus shelter. We were asked to interpret the moment in our own styles and were given free reign to re-imagine each bus shelter. We wanted to create an all encompassing experience, inside and outside. The first part was wrapping the entire bus shelter in a colour that was out of place in its immediate surroundings. This immediately creates interest from the regular commuters and passers by, as well as mentally prepares the viewer for an experience. Art exhibitions are usually seen as elite or private events and we wanted to create that same intimacy and attention to detail for the viewer in the public sphere. Faatimah (Mrs Luke) used plastic building blocks to create a central icon designed around the moment for the interior of the bus shelter and added smaller shapes to create pattern and a colourful playfulness. Al (Mr Luke) created pattern to the exterior using complimentary vinyl cut outs and then added bold, expressive line-work to narrate the full story that created the moment. All the vibrant colour and pattern created was used to translate the exhilaration felt at the moment of victory. 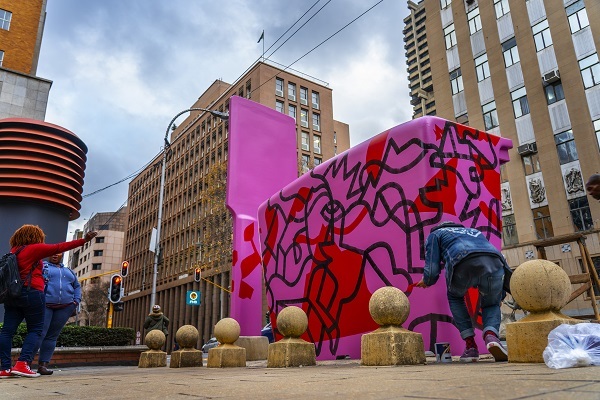 Tell us a bit about the experience of creating these works throughout the city of Joburg. The first day was pretty cold and windy so it presented some challenges, but we adapted really quickly. By day two, we had learned new techniques and completed each bus shelter in a few hours. It was so great to be installing while the bus shelters were actually being used by commuters. Everyone was so intrigued and excited. We loved hearing the different interpretations of the moments and we even got a few job offers. 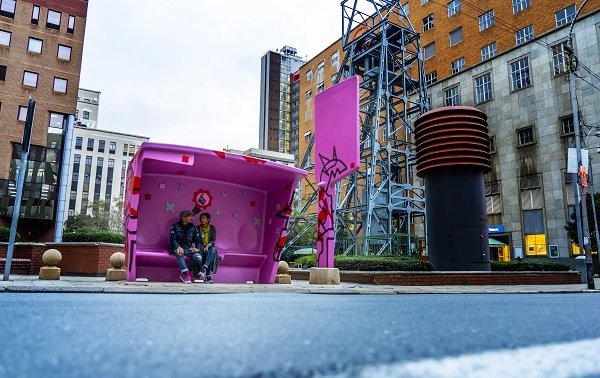 We absolutely adore Johannesburg and it was such a privilege to be allowed to create public installations for everyone to enjoy. Do either of you have a favourite bus stop out of the lot? We love them all, its cheesy but its true. 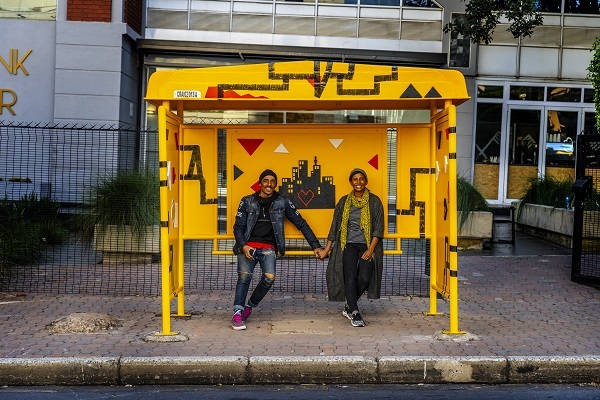 Every time we finished a new bus shelter, we both loved it and agreed that it was our favourite and then the same thing happened at the next shelter :) So of course, that means the last shelter we did in Melville is our favourite. The colour palette is rich and interesting, and the moment itself is very relevant to this period in our lives and our careers. Find more work by Mr and Mrs Luke on their website.